When there is a lot going on it is a good to remind yourself of a little history and why you are here. Devon and Cornwall Police have been doing that recently. On the 1st April this year we were officially 50 years old. That is seven years younger than Simon Cowell and five years older than David Walliams according to Wikipedia. And we have been celebrating. There have been "High Teas" for former officers and our friends, events to meet the public, a time capsule entombed in a mini obelisk and fancy "50th Anniversary" epaulettes sold to raise money for the Chief Constable's charities. Our history may not be as long as some, such as the Metropolitan Police in London who opened for business in 1829 and haven't closed since, or the Great Western Railway (GWR) that ran its first train in 1835. The track Isambard Kingdom Brunel built still crosses his bridge at Saltash and runs the length of Cornwall to Penzance. I once met a "passed fireman" who used to work the footplate and feed coal to the boiler of a GWR engine, and he had stories about smaller railway companies joining GWR. So it has been for Devon and Cornwall Police. 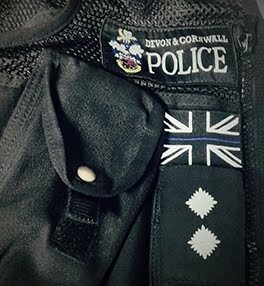 In 1967 the Cornwall County and Isles of Scilly Constabulary, more commonly called the Cornwall County Constabulary joined the Devon and Plymouth Constabularies and so we were born. The Cornwall County Constabulary of 178 constables, 1 sergeant major, 2 superintendents and 1 chief constable in the name of Colonel Walter Raleigh Gilbert was formed 110 years earlier in 1856. He was a descendent of the Sir Walter Raleigh's half brother. At this time there had for 20 years already been Borough Police forces in Bodmin, Liskeard, Launceston, Truro, Falmouth, Helston, Penryn and St Ives. The Cornwall County Constabulary filled the gaps and started amalgamating these smaller forces. The Bodmin Borough Police, all 3 of them, held out until 1866 before amalgamation. The final amalgamation was in 1947 when the Isels of Scilly Constabulary joined forces. I don't know how many of them there was, but I would guess that they needed some persuading. The world continues to change, the era of fish riots in Penzance where the Army helped the Chief Constable restore order and cutlass wounds were common have thankfully long gone. Today has its own challenges which in time will seem to be outdated and things of the past. Right now we are working ever closer with Dorset Police in a Strategic Alliance. So that is my police family's history, up until now. As to the why we are here, I'll summarise how my Chief Constable and a former Commissioner of the Metropolis put it. We prevent and detect harm and crime, protect the vulnerable, safeguard communities and we are always resilient and ethical. It's a little too long to make a strap line or sticker for a police car, but some things just are. And it's not really changed in the last 160 years. I like to think it is pretty well summarized by the saying we are "The Thin Blue Line". That's it for now except to say please take care when you are driving, be kind to each other and try not to covet your neighbour's nice things. Thank you Emma Glour. Sorry it took a while to reply.